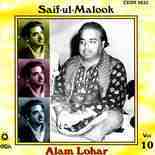 Alam Lohar gained popularity in Punjab for his folk singing , especially for his Jugni, the most renowned of Punjabi Folk songs. Descending from a family of Blacksmiths, Alam Lohar was the first mainstream artist to gain wide acclaim for his use of Chimta as a musical instrument. Following are some of his popular songs from his album Saif-ul-Mulook. His legacy continues with his son Arif Lohar.